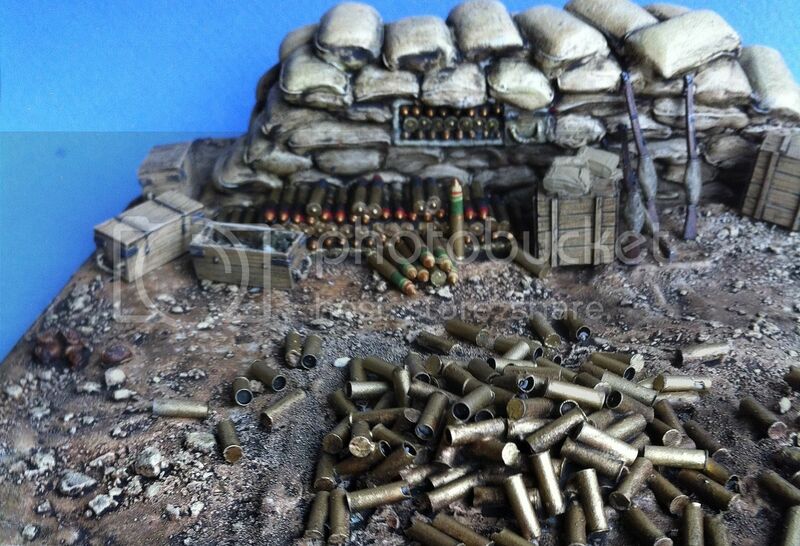 An exciting new development form the well known manufacturer Resicast is the introduction of some diorama bases to compliment some of their existing kits. This new range is marketed under the GBS label and importantly to note is that the GBS range will only be available directly through Resicast. This should help to keep the cost of the bases down. 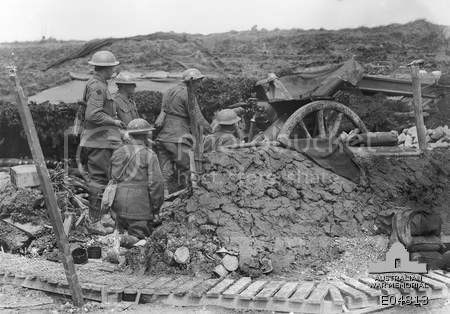 Whilst the base has a WW1 theme, the British 18pdr was used in the early part of WW2 with the BEF, I see nothing that couldn’t be incorporated into that era either. Whilst we think of WW1 in term of the European theater of operations this base is generic enough to be used across many theaters of operation during WW1 and early WW2. The kit comes packed in a nice sturdy box with the GBS logo shown on the top left hand corner. The cover art is a photo of the constructed base with three small pictures of the kit. The parts were wrapped in bubble wrap for protection. The kit consists of 4 main parts, and 3 bags of accessories to add to the scene. Cast in a light grey resin the base as you would expect is highly detailed, so lets take a look at the parts. The main base measures just over eight and a half x just under 6 and a half inches or 210mm x 160mm if you like. The base had nice ground work with a scattering of stones/rubble and a double row of 7 on 9 sandbags towards one end. To add to the main base are 3 bulk elements. 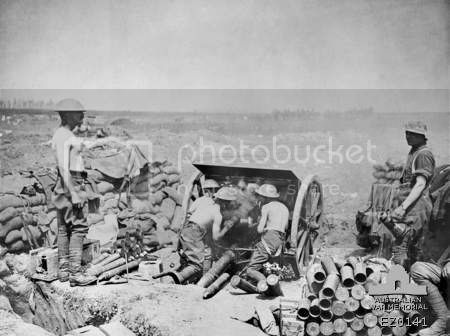 A stacked double thickness wall of sandbags 7 bags high into which is incorporated, on one side, some stacked 18pdr shells and an ammunition box. This wall fits to the base forming an L shaped structure of sandbags. 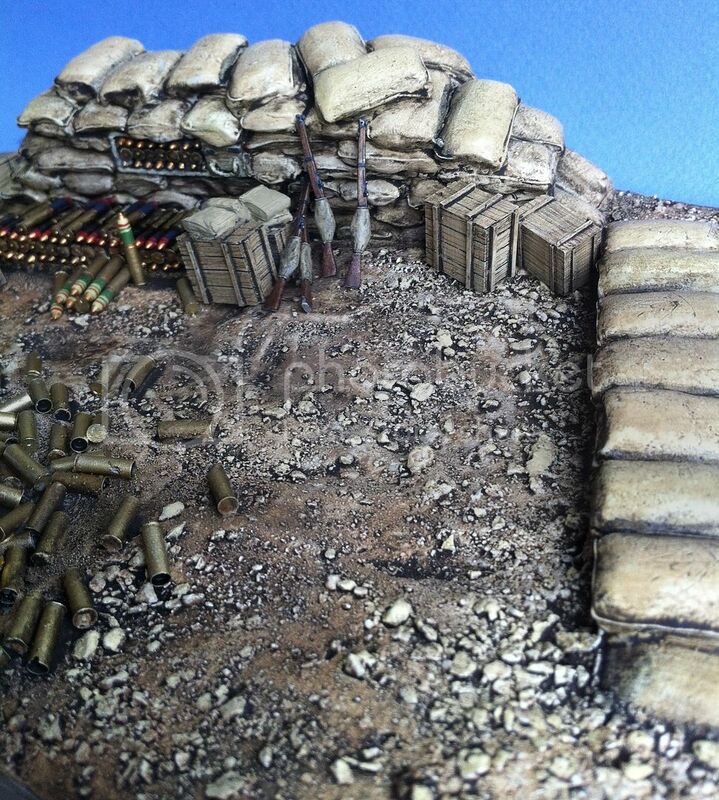 To sit in front and to the left of the wall of sandbags is a 5 tier mound of stacked 18pdr shells. Finally to complete the main base is a rectangle of empty shell casings that is added to the open end of the diorama base. No instructions come with the kit but the parts are self evident and the box art will guide the modeller if in any doubt. To add yet further detail to the base you get a range of additional items in 3 separate zip bags. The first of these contained 3 ammunition boxes, two of which are closed and one of which is open showing what appears to be some kind of canvas/ cloth cover or camo net. The other two boxes which are of differing sizes are of the wooden generic type box, so a 5 box bag. The next bag contained 4 SMLE rifles with breech covers and a further two joined wooden boxes with 5 respirator haversacks sitting on top. The 3 and final bag contained more ammunition being made up of 9 individual compete shells and 24 charges/spent casings. This is a very interesting and welcome development. 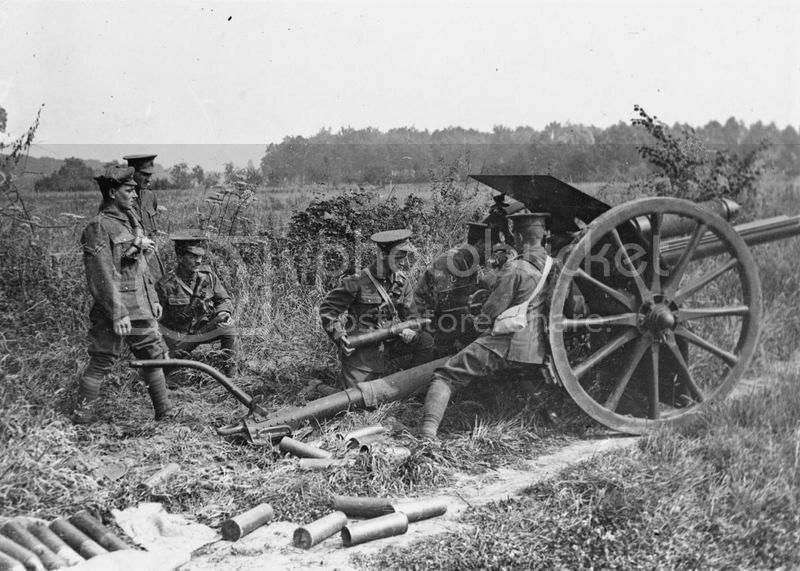 Why an 18 pdr base you might ask; Resicast already offers the 18pdr in early BEF format and just released is a further version covering the WW1 gun and limber. 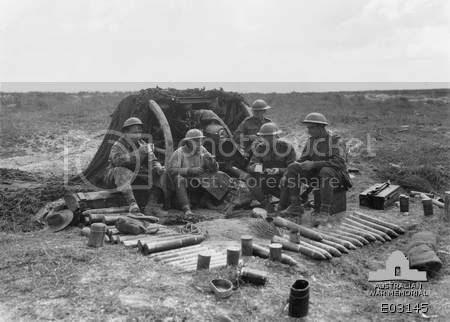 There aren’t many artillery bases around and one feature of any artillery position is normally the large pile of ammunition and spent shell casings that accompanied the gun and that area has been nicely addressed with this base. Whilst specifically designed with the new WW1 18pdr in mind, a WW2 18pdr gun wouldn’t be out of place in this setting either. Overall the detail looks very good, and I like the layout of the main items. The bulk ammunition is a real plus and a nicely detailed range of additional items are provided so you can develop the base to your own thinking and preference . There is great flexibility as to which theater of war you might finish the base in, so again lots of individual choice for it’s final setting. Then size is good and this one should make a very pleasing platform for the gun to be displayed on. The casting looks excellent although you will need to add some straps to the respirator haversacks so these might have been better as separate items. You will need a decent razor saw to remove the pour plugs from the items and a sanding block to smooth the underside of the main base, although if you were setting this into plaster then it probably wouldn’t matter . Normal safety precautions apply when working with resin. This is a very exciting development. 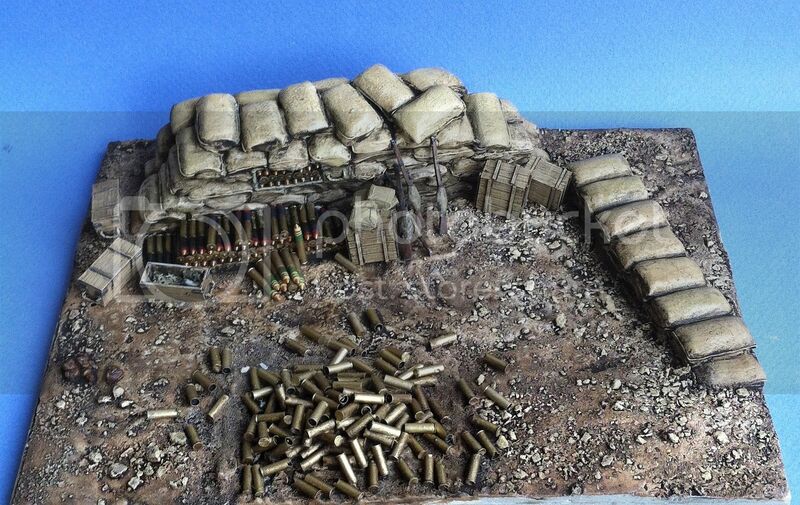 Not only is the base WW1 focused but bases for artillery pieces are not plentiful and if you don’t have the time to construct you own, which many of us don’t, then this will save a large amount of time and effort and give you an accurate platform for you model display. Anyone wishing to could incorporate this scene into a larger setting of they chose to do so. An excellent offering from the new range of GBS kits. Please remember these can only be obtained directly from Resicast and should be available at the Telford Model show this year. The 18pdr shown on the base is the EMHAR offering not the new Resicast gun. GBS is a subsidiary of RESICAST. GBS is ONLY available direct. (direct sales or trade fares) (there will be no allowances for others to sell the GBS range of items. Glad to see an artillery fire base with a freakin' great pile of discarded empties. Nice photos....You Tube has some great film sequences of the gun firing....I am still anmazed at the length of the recoil on these guns.